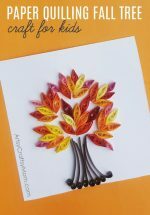 This Easy Paper Pumpkin Thanksgiving craft is bound to be a hit with kids. The step-by-step tutorial makes it an enjoyable group activity. Use it as a decor piece or for personalized cards! No festival or celebration is complete without an elaborate spread of delectable food, right? At the mention of Thanksgiving, apart from the famous turkey roast, images of pies, desserts, and flavourful sauces fill your mind taking you on a sensorial food tour. 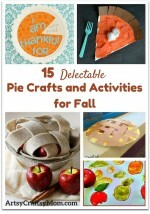 Talking of pies, did you know pumpkin pies are an integral part of the feast? 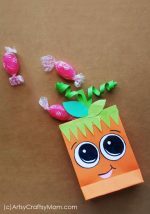 What a wonderful to make this nutritious vegetable appealing to kids! Now, interestingly, pumpkins are also associated with Halloween. The famous Jack-o-lantern is an oft-repeated story told to kids to teach them right from wrong. So, depending upon the kind of parent you are, you could spook them into eating the pumpkin or encourage a genuine liking for it. I, personally, would go with the latter option. 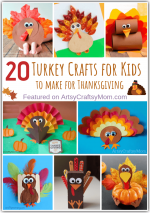 And, if there’s a cute pumpkin Thanksgiving craft to boot, then who knows, I’d have created a pumpkin lover for life! 1. Cut a long strip (12-inch long and 1.5-inch wide) from an orange-colored craft paper. 2. Create small and evenly sized accordion folds on the strip lengthwise. 3. Cut out 1 or 2 leaf patterns from a green-colored craft paper. Prepare loose coils and a spring shape with green colored quilling strips. Use different shades of green for each of these items. 4. Take the accordion folded paper prepared in step two. Glue both ends of the folded strip to form an accordion folded ring. 5. Hold any one end of the accordion folded ring and press it towards the center. Flatten the piece towards the center. 6. Cut out 2 round shapes from the orange colored craft paper and glue them on the center of the flattened accordion folded piece, on both sides. This will secure the flattened shape. 7. Are you done creating everything? Now, it’s time to assemble all the parts. Don’t forget to grab a small piece of a dry twig as well! 8. Glue the twig on the round accordion folded piece (the pumpkin), keeping half of the twigs end facing outside the pumpkin. Stick the leaves on both sides of the twig or as you desire. 9. Finally, stick the loose coils and the spring shape with the pumpkin; these are the vines. Once you are happy with the pumpkin design allow the glue to dry for a while. Now that’s a pretty easy pumpkin, right? 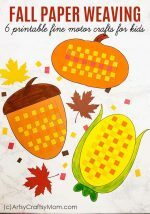 Yes, it’s simple enough for primary school goers and pretty enough to frame – how’s that for a unique wall decor idea for fall? 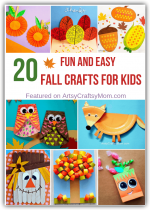 Don’t forget to check out our collection of awesome Fall Crafts! This looks quite easy! Will try it! Thanks!